The Eustis Estate is a rare surviving example of late nineteenth-century architecture and design. Designed by renowned Boston architect William Ralph Emerson and built in 1878, the Eustis Estate sits on eighty acres of picturesque landscape at the base of the Blue Hills. Full of stunning, intact architectural and design details, the Eustis Estate is a historic site unlike any other in the Greater Boston area. Take a self-guided tour of the house and grounds in the order that you choose. 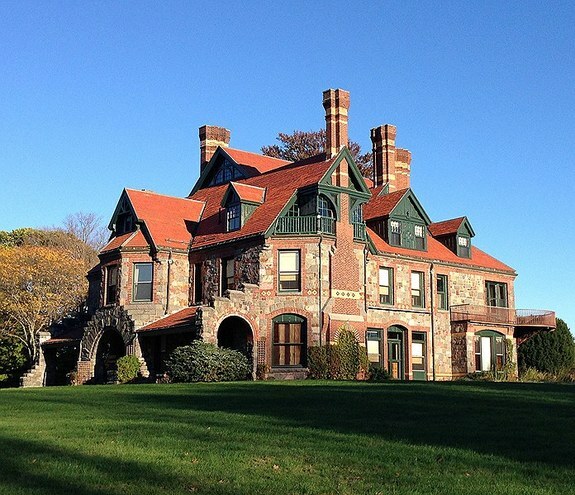 The stone mansion includes richly carved woodwork and dramatic stained glass windows. A great hall soars three stories to a decorative trussed ceiling. Restored wall treatments present original colors highlighted by metallic paints that glitter and glow when illuminated by ornate brass chandeliers. Learn about the elaborate architecture and interior design as well as the Eustis family, their domestic staff, and the farmhands who cultivated the surrounding fields and greenhouses. In the visitor center, browse the museum shop. Admission includes access to the museum and the exhibition currently on view in the second-floor galleries. Free for Historic New England members and Milton residents.